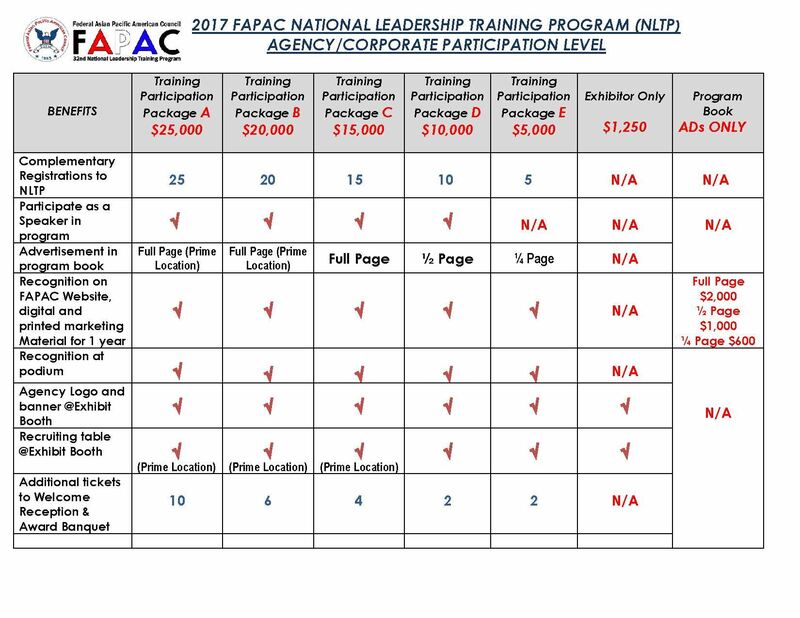 On behalf of the Federal Asian Pacific American Council (FAPAC), we would like to invite your agency/company to provide support and participate at our 32nd Annual National Leadership Training Program (NLTP) to be held on May 15-18, 2017, at the Hilton Rockville, Rockville, MD. The theme for this year is “Unite Our Voices by Speaking Together”. The NLTP is held to coincide with the observance of Asian Pacific Islander Heritage Month. It is the largest conference of its kind. 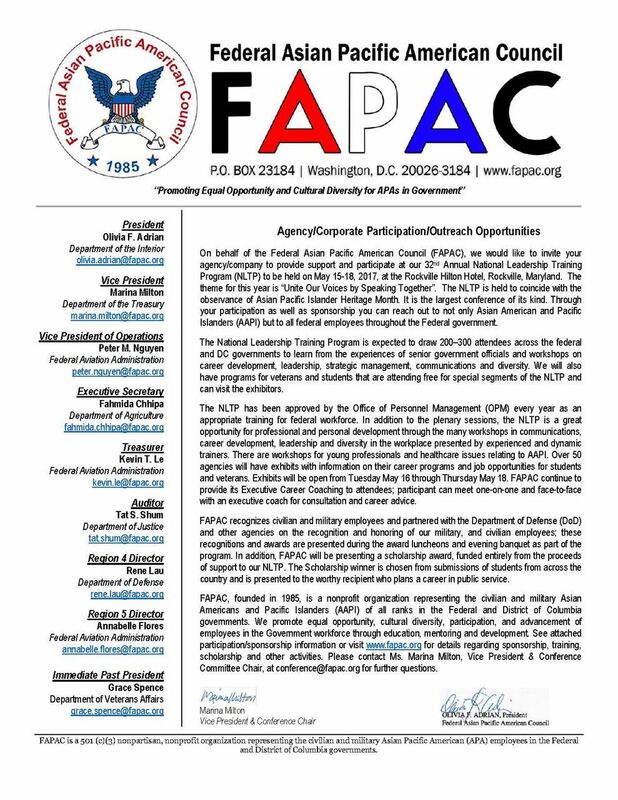 Through your participation as well as sponsorship you can reach out to not only Asian American and Pacific Islanders (AAPI) but to all federal employees throughout the Federal government. The National Leadership Training Program is expected to draw 200–300 attendees across the federal and DC governments to learn from the experiences of senior government officials and workshops on career development, leadership, strategic management, communications and diversity. We will also have programs for veterans and students that are attending free for special segments of the NLTP and can visit the exhibitors. EXHIBITOR SPACE : Prime exhibit booth space is being reserved for Conference Sponsors. Other exhibit space will be assigned on a first-come, first-served basis. Corporation, companies, federal, state, and local agencies promote their employment opportunities as exhibitors. Colleges, universities, and community organizations are welcome as exhibitors. Each exhibit space includes a back wall drape, draped table, two chairs, and exhibitor’s sign. Space assignments will be made only when all relevant information and full payment or authorized purchase order/requisition are received. WHAT SPONSORS CAN EXPECT: Our conference attracts the attention of thousands of Asian Pacific American professionals in government, business, and the military throughout the government. More than 500 representatives from virtually every Federal Department and Independent Agency and the Government of the District of Columbia attend, plus visitors and participants from university and college communities, high school students, community organizations and the community in general. Plenary sessions, keynote speeches, and workshops are led by top government officials and managers and Members of Congress. This is the primary national conference scheduled in connection with National Asian Pacific American Heritage Month at the Federal level. ADVERTISING OPPORTUNITIES: Advertisements in the official Conference Program will be accepted upon availability of publication space. Priority advertising space will be given to Sponsors. Color separated and black-and-white camera-ready artwork must be received no later than March 31, 2017, accompanied with full payment or authorized purchase order/requisition. If typesetting, design, layout or paste-up is required, the cost will be charged to the advertiser.